We are pleased to confirm that 14 of our university researchers have been selected by CIFAR as Canada CIFAR Chair in Artificial Intelligence (IACC). The announcement of this first cohort and the $ 30 million funding and was made at the first annual meeting of the Pan-Canadian AI Strategy. The Canada CIFAR Chairs program aims to attract and retain more than 50 leading researchers in artificial intelligence. The 29 chairs selected in the first cohort, who will receive $ 30 million in total funding, are recognized researchers, but also researchers who stand out at the beginning of their career. Affiliated with Mila of Montreal, Vector Institute of Toronto or Edmonton Amii, these researchers are expected to play a major role in the development of research in the Canadian AI ecosystem. Marc G. Bellemare, Adjunct Professor at McGill University and expert in deep learning through reinforcement, continuous learning, and exploration through reinforcement learning. Yoshua Bengio, Mila’s Scientific Director and Professor at the University of Montreal, has made pioneering contributions in deep learning and reinforcement learning. Jackie Cheung, an assistant professor at McGill University and expert in computational linguistics, natural language processing, automatic summarization, and computational semantics. Aaron Courville, assistant professor at the Université de Montréal and expert in deep learning, reinforcement learning, generative antagonistic networks, innovative generative models. Simon Lacoste-Julien, assistant professor at the Université de Montréal and expert in machine learning, optimization, statistics, high-dimensional data analysis, and structured predictions. Hugo Larochelle, Adjunct Professor at the Université de Montréal and expert in deep neural networks, meta-learning, punctual learning, and reinforcement learning. Ioannis Mitliagkis, Assistant Professor at the Université de Montréal and expert in statistical machine learning, optimization, distributed and large-scale learning systems, and expanding accessibility to machine learning. Christopher Pal, Associate Professor at Polytechnique Montréal, Adjunct Professor at the Université de Montréal and expert in deep learning, artificial vision, natural language processing, and medical imaging analysis. Joelle Pineau, associate professor at McGill University and expert in reinforcement learning, robotics, deep learning, natural language processing, robotics, and AI for health. Doina Precup, associate professor at McGill University and expert in machine learning, reinforcement learning, Markov decision processes, and machine learning and AI applications. Reihaneh Rabbany, assistant professor at McGill University and expert in data mining, network science, computational social science, and IA for social good. Blake Richards, assistant professor at McGill University and expert in neuroscience, reinforcement learning, animal intelligence, memory, and machine learning for neuroscience. Jian Tang, assistant professor at HEC Montréal and Université de Montréal, and expert in network analysis, deep learning, natural language processing, AI for drug discovery, reinforcement learning, and statistics. Pascal Vincent, associate professor at the Université de Montréal, has made pioneering contributions in deep learning and natural language processing. 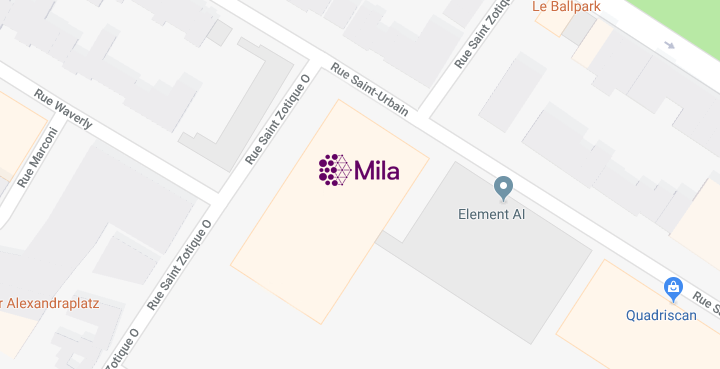 Mila brings together the highest concentration of research and development in deep learning and reinforcement learning. In its new premises at the O Mile-Ex Complex, Mila will create a unique territory of innovation and technology transfer in artificial intelligence that will develop interactions with industry and spark the emergence of startups, while integrating the social impacts of artificial intelligence in his projects. Congratulations to all new incumbents.